A healthy digestive system is extremely important to your dog’s overall health. Unhappy digestion makes an unhappy dog. 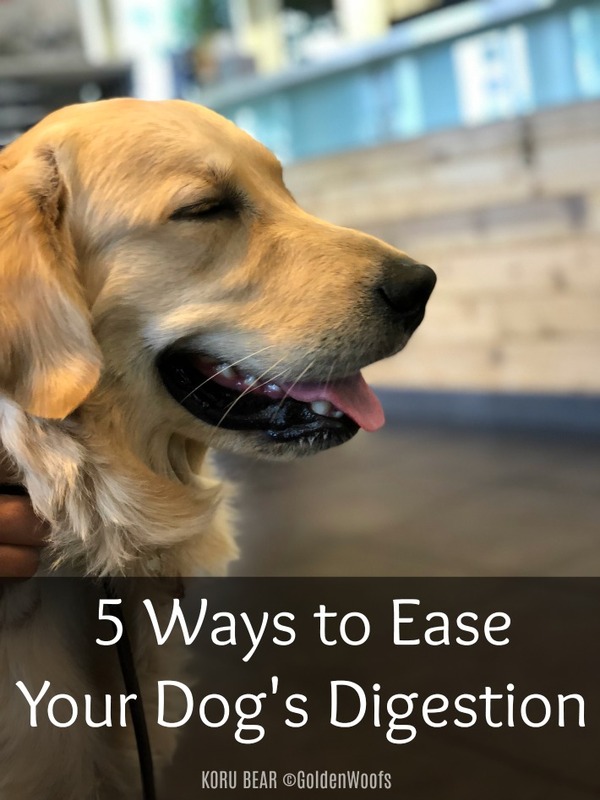 If your dog’s digestion could use some improvement, here are five ways to help your dog’s discomfort. The best known probiotic food is yogurt. Why? Yogurt contains good bacteria. 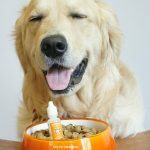 Adding a spoonful of plain, low or non-fat yogurt to our dog’s mealtime can provide digestive relief. 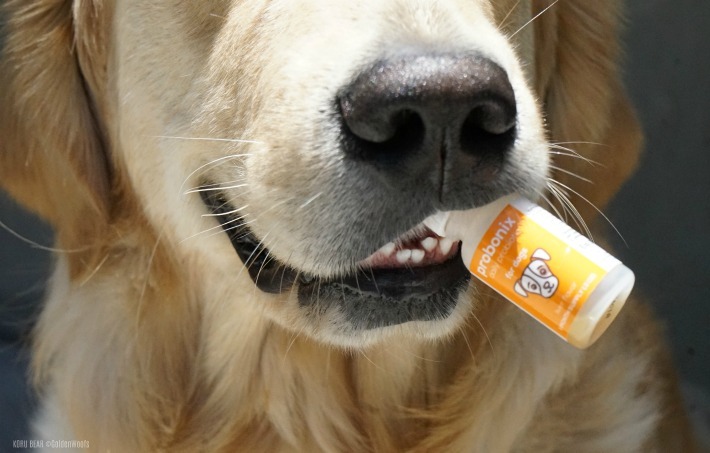 A fun way to add yogurt to your dog’s diet is making homemade frosty treats. KORU BEAR’s favorite are my Kong Shaped Frosty Berries dog treats mixed with strawberries and superfood blueberries. Pumpkin a fiber-rich food can ease dog’s digestion in several ways. 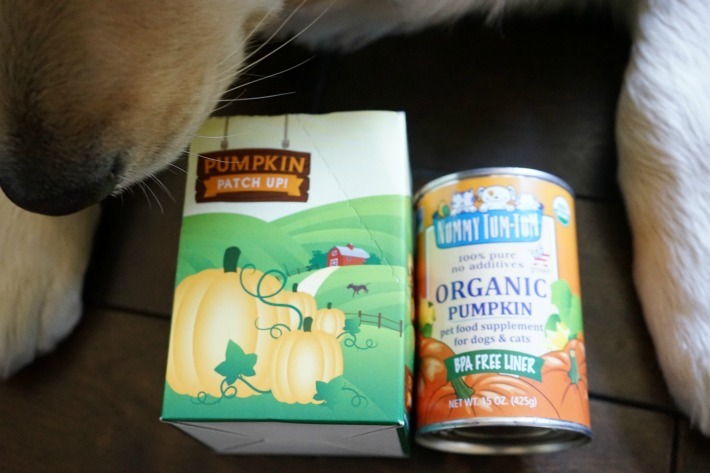 Plain, canned pumpkin can be a great addition to your dog’s diet. Pumpkin contains beneficial vitamins and minerals, such as vitamins A, E, and C, and potassium and iron. When the fresh pumpkin is not available in the store, I use Nummy Tum-Yum Organic Pumpkin and on the road, it’s very convenient to add pumpkin with Weruva Pumpkin Patch Up! Bone broth is known as a magical feel-good superfood and promotes a healthy gut. It is loaded with glycine, which helps digestion. 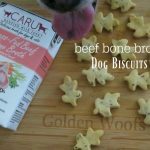 A homemade bone broth takes a long time to make so I prefer CARU Grass-Fed Beef Bone Broth. I use it in three ways: to moisten KORU BEAR’s kibble, frosty broth treat, and/or hydration water. 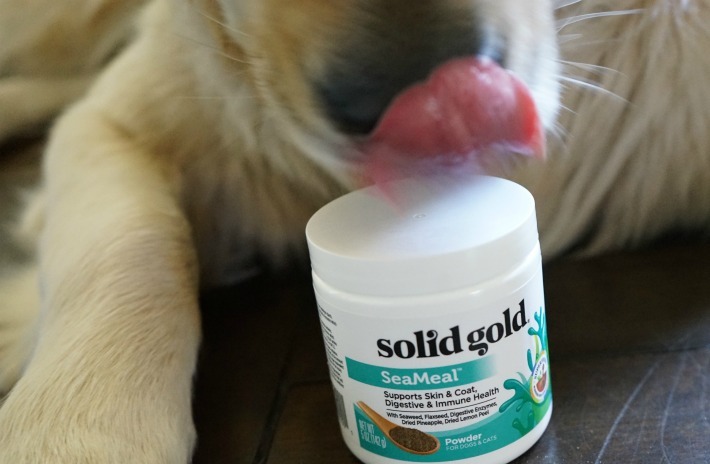 Kelp is known to aid dog’s digestive system; to flow smoothly and function properly. I use SealMeal from Solid Gold. It is a powdered kelp-base digestive health supplement. It contains seaweed, flaxseed, digestive enzymes, dried pineapple, dried lemon peel. To ensure you’re supplying the right types of bacteria, it is important to provide only probiotics formulated specifically for dogs. KORU BEAR’s digestive health improved from Humarian’s Probonix, a liquid probiotic for dogs. Probonix played a special role in KORU BEAR’s poop. 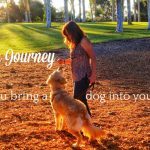 On a previous post, The Poop on Probiotics, I shared how Probonix helped firm-up his poop. 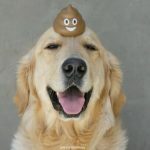 Your dog’s poop definitely can tell you about his digestive health. A healthy happy gut is essential to your dog’s overall well-being. A healthy bacteria like Probonix can provide comfort and eliminate the bad bacteria that causes your dog’s digestive problems. A healthy digestion means a happier, healthier dog! 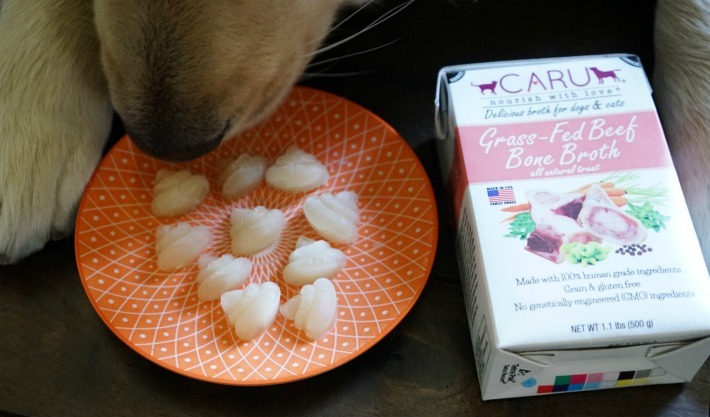 What other products have you used to ease your dog’s digestion? Certainly some good tips here for most dogs. Unfortunately, I have to be REALLY stingy with stuff like yogurt and pumpkin with my girls. The yogurt is mostly dairy, which, if given too frequently or in too-high quantities upsets their tummies. And pumpkin, though not a dairy product, has the same effect. I find that the best defense for my girls is Hills’ Prescription i/d. I know some people will tell me it’s “crap”. That’s okay. They can say what they want. I stick with it because it works. And because I know my dogs’ medical history, they don’t. If they get ugly about it, I will set them straight. I tried powdered probiotics but did not help. Probonix sounds interesting and will check it out. Yogurt and pumpkin are so yummy! Thank you much for sharing your tipps! Will definitely check them out, if my Happy has some trouble with her digestion. Lover the video by the way! Hi, thanks for this great tips. Usually while making a treat to the dog, I will add the yoghurt to the mixer and it will be 2 in 1 solution to your dog, a treat and a digestion helper. But, may I ask something, is it okay to give the dog the coconut oil as well? I heard it good for human and maybe for the dog too. I mean to aid the dog digestion naturally instead of 5 ways above. I love to see the video, what a good boy and a happy dog. Reading the label and making sure that the ingredients listed are well suited for their diet is the basic step in making sure that their food agrees with them. For instance, consider adjusting their carbohydrate intake by switching from grains that are though to injest like soy, wheat and corn to easily digestable legumes and potatoes. My furry companion loves having bone broth and pumpkin. Will surely try the probiotic supplement. Thank you for sharing this. thanks for sharing! It’s true it so yummy my beloved Argo likes yogurt and organic pumpkin. Even I have the new buddy now I still remember him and hoping he still with us and thank you to the for helping us and give him a pet cremation.